The Raymond Wong Pak Ming and Donnie Yen Chi Tan produced, Yuen Woo Ping (Lord Eight) directed kung fu action film MASTER Z: THE IP MAN LEGACY (IP MAN OI JUEN: CHEUNG TIN CHI) will open on the 20th. 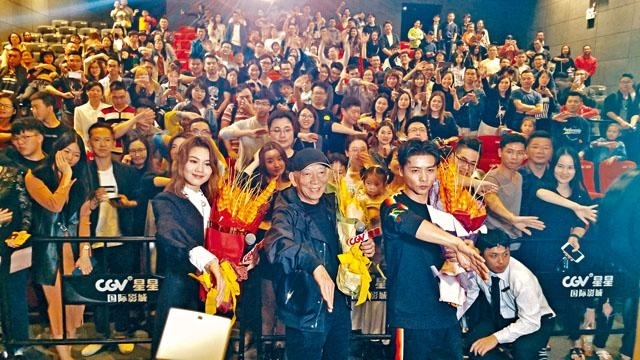 Yesterday Lord Eight led leads Max Zhang Jin and Chrissie Chau Sau Na to the home of martial arts Foshan to begin its promotion. Wherever Zhang Jin went, people kept asking to either demonstrate his kung fu or spare with them; Being abused nonstop in the film, Chau Sau Na left many viewers with heartaches as they felt sorry for her. Lord Eight led Zhang Jin and Chau Sau Na first to the International Wushu Federation's Wing Chun competition opening ceremony. The host already asked Zhang Jin to demonstrate his kung fu on the stage. Zhang Jin then made the "Cheung Tin Chi" trademark pose. Later he went to many cinemas for audience appreciation events. A foreigner viewer demonstrated Wing Chun and someone stated that they would like to spare with Zhang Jin. Students at the sports academy wanted to practice with Zhang Jin. Zhang Jin said, "Practicing kung fu would be no problem, but with the film release on the way. If you want to see my kung fu clearly, of course buying a ticket to the movie would be the bvest." Foshan was the home of martial arts. Everyone's passion and pursuit of kung fu was understandable to Zhang Jin. In the film Chau Sau Na was slapped around by Kevin Cheng Ka Wing and forced to take drugs. Many viewers asked her if the shoot was difficult. Did she want to fight back? Chau Sau Na said, "I don't know kung fu at all, but I admire Lord Eight very much. I really want to watch Lord Eight make a kung fu film, so I thought I would start with getting hit. When I learned then the next time I would learn to fight, haha." Lord Eight did not know whether to laugh or to cry, saying that she passed and she could try fighting in the next one. With many kung fu fans, Lord Eight was asked to pose for a photo. When Lord Eight wanted to make a Wing Chun pose, the fan asked him to make a heart gesture instead and stunned Lord Eight for a second.